Jane Austen has certainly enjoyed a renaissance at the movies in the last several years. Not only have there been recent film versions of Pride and Prejudice and Sense and Sensibility; we’ve also seen Pride and Prejudice and Zombies! What more could we want? 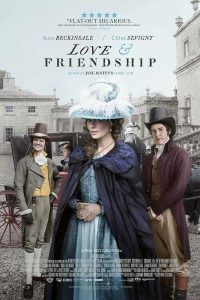 Now there’s an acclaimed new film made of Austen’s novella Lady Susan, entitled Love and Friendship. American writer/director Whit Stillman has done the adaptation for the screen. In some ways, Love and Friendship has the characteristics of other Austen films, including great period costumes and lovely English scenery. However, unlike some versions of classics, Stillman’s is surprisingly funny. The clever observations that Lady Susan Vernon (Kate Beckinsale) a recent widow, shares with her friend Alicia (Chloe Sevigny), are priceless. The story involves a scheming Susan looking for a husband for both herself and her daughter Frederica. The movie abounds with so many characters in 18th Century costumes, it’s hard to remember who’s who. Among the most prominent among them are the handsome young Reginald and the buffoonish Sir James. British Actor Tom Bennett is wonderfully silly as Sir James. You won’t hear the name Churchill again or see a plate of green peas without remembering his take on them! I won’t say too much more about the plot. However, you have to pay attention to follow the intricate plot. At a time when many movies run well over the two hour mark, Love and Friendship is a brief one hour forty minutes. I was startled when it ended, and wanted it to go on longer, not just for the sheer enjoyment, but also to absorb what happens in the final minutes. It’s one of those “what just happened?” moments that I want to see again. In addition to Bennett’s Sir James, Kate Beckinsale’s performance is noteworthy in a fine cast. For a promising actress who has been mainly relegated to playing in action films, she is wonderful here, lovely, smart, scheming, and possessing a razor sharp tongue. I’m far from an Austen expert, but, Susan seems different from most Austen heroines, who seem so restrained. Not so with Lady Susan! Award season is many months away, but I certainly hope Beckinsale will be remembered for her performance. I’m also aware as I write this review that the Sunday lectionary readings involve two widows who have lost sons. The situation of widows in 18th Century England may not have been as precarious as in the ancient world, yet, as other Austen novels have shown, it was of utmost importance for a woman to marry well. The widowed Susan is well aware of the need to find a suitable husband, both for herself and her coming-of-age daughter. Yet there’s a very modern streak in Susan who is nobody’s fool, and will not wait idly by until the right man comes along. I certainly think you’ll enjoy Love and Friendship. It’s a great way to kick off the summer season.